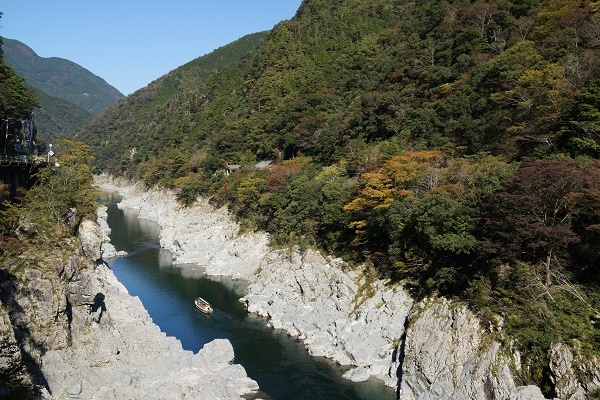 The Oboke Ravine Pleasure Boat travels down and then back the Yoshino River in about 30 minutes, offering the passengers scenic vistas of the grandeur of nature's handiwork as they glide through the ravine. Crystalline schist resembling marble sculptures rises above the boat on both sides, giving tourists an awesome sight. You will enjoy the changing season through fresh green in summer, coloured leaves in autumn and even snow in winter. Get off at Ikawa-Ikeda IC→Take the National route 32 bound for Kochi→Oboke（Journey time is approx. 35 minutes by car.） Takes approx. 30 minutes on foot or 5 minutes by car from JR Oboke St. to Oboke Yuransen terminal.